Here we have another scale model, a garden maze, created for a print ad and designed by Anton Tremblay. By 1986, I was working on many of Anton's projects and we became fast friends. 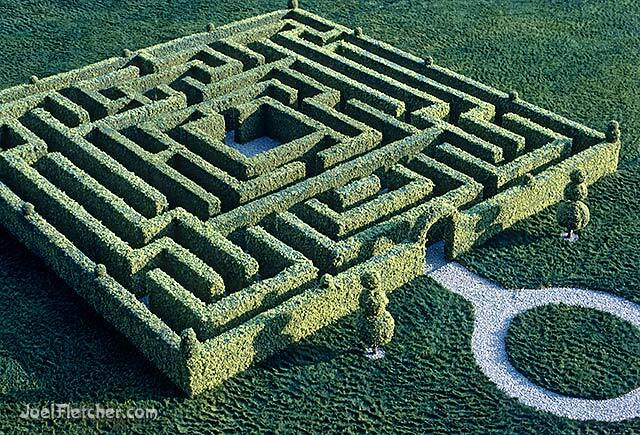 It was a lot of fun to make the maze, cut the basic shapes out of Styrofoam and paint them green. To give the appearance of hedge foliage, we applied white glue and then sprinkled on a shredded foam "ground cover" product that was originally made for model railroads. The grass area was actually made of carpeting, painted green and carefully brushed to give it a natural clumping appearance. For the pathway, we found that fine aquarium gravel worked well. The completed garden labyrinth model was about three feet per side in scale. I photographed this image outdoors for a realistic effect. Although I never saw the actual advertisement, I suspect it probably looked quite different from my personal shot. 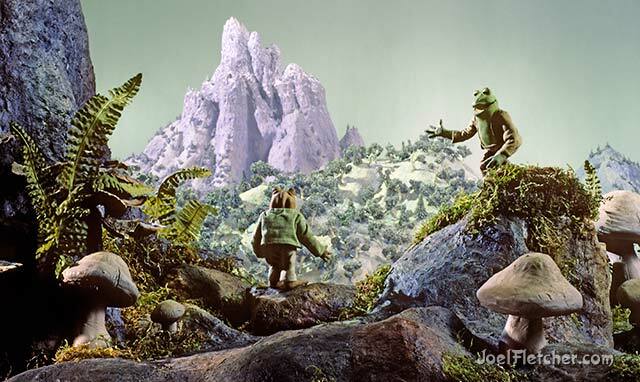 The mountain is from the 1987 stop-motion film Frog And Toad Together. 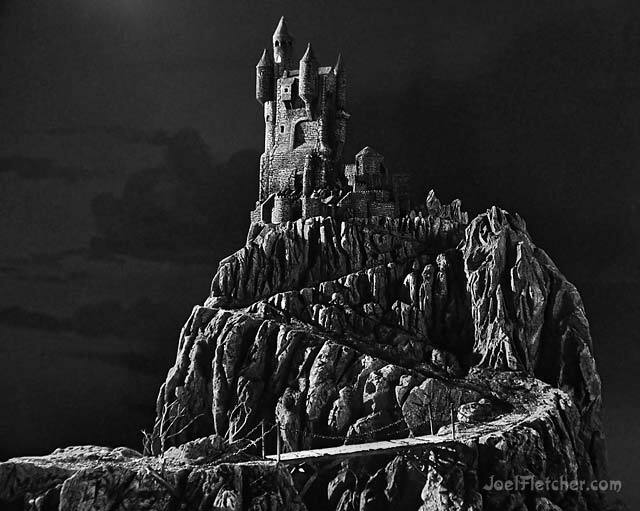 Besides being a principal animator on the production, I also constructed several of the sets. Director John Clark Matthews tended to prefer using craft store materials for his movies. For instance, most of his sets were made of Celluclay, an instant papier-mâché product. I sculpted the distant mountains and the foreground using either chicken wire or screen over a wooden support to get the basic shapes. Celluclay was then applied on top to give a nice organic feel. After a paint job with acrylic paints, I added scale model railroad trees to the mountain and dressed the foreground piece with mosses and artificial ferns. To give a sense of distance to the mountain, a stretched sheet of translucent material called "bridal veil" was placed between the foreground and background. That idea came from an old special effects trick that had been used to give the illusion of atmospheric perspective. The frightening forest from Frog And Toad Together was fun to create. I fabricated the trees and rocks using the aforementioned Celluclay over chicken wire method. It was easy to achieve a convincing bark texture by sculpting the Celluclay. Artificial leaves from the craft store came in handy and they were in perfect scale since the sets were 1/1 actual size; however, we cheated the scale of the tree trunks for the desired effect. 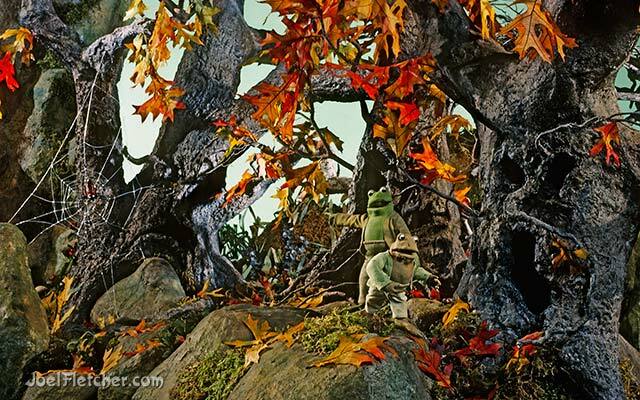 In reality, trees would look gigantic compared to the characters, Frog and Toad! I used the same techniques for the snake cave set. Note that the Frog and Toad world included a light green sky. 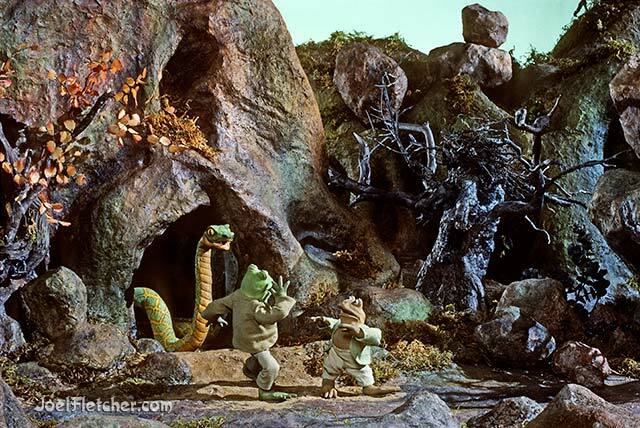 By the way, the snake puppet was sculpted by my buddy, Don Waller, while John Clark Matthews sculpted Frog and Toad. Nikki Matthews handled the foam latex puppet fabrication and clothes. I was an animator on the 1987 ABC television special Runaway Ralph. I also made this grandfather clock dwelling and several specialty props for the production. The set was actually constructed inside a real clock to which I added a couple of wooden platforms on which Ralph could perform. Then I dressed the set with various items and weathered everything with paint to give a grimy, lived-in look. 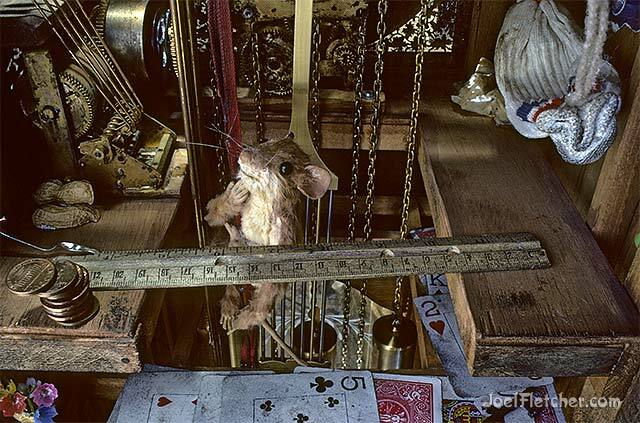 Additionally, many of the clock mechanisms were rigged for the purposes of our stop-motion animation. I also created this custom watch for Runaway Ralph. Based on a sketch by John Clark Matthews, it depicts a super-hero mouse similar to the famous Mighty Mouse character. I started out with an ordinary Timex watch and built up around it with Sculpey modeling clay. After completing the sculpture, I made a silicone mold, then two castings out of polyurethane. This method allowed me to incorporate both the working watch movement and the crystal for additional realism. Gloss enamel paints added detail, color, and shine. 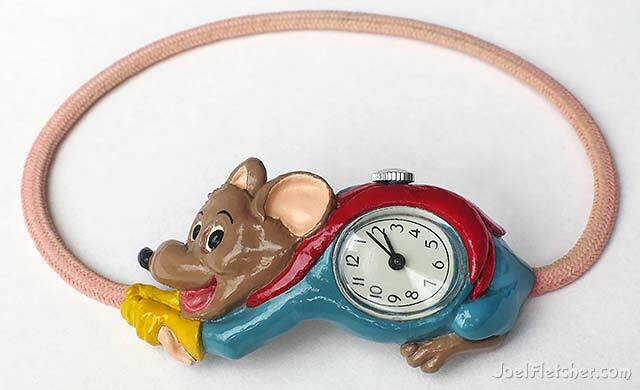 The watch band was made of a stretchy material and painted pink to look like the mouse's tail. The ultimate result was a prop that looked like a manufactured children's watch. I made two watches in order to allow simultaneous filming on separate stages if necessary. In the movie, the watch served the purpose of a "MacGuffin" - an object of interest that helped to drive the story. Read part 1 and part 3 of Making Models and Props.